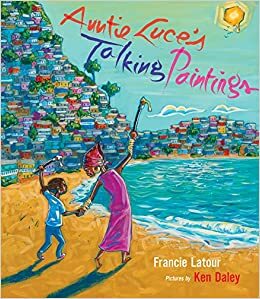 Summary: A little girl tells about traveling to Haiti, her mother’s birthplace, to visit her artist Auntie Luce. Auntie Luce shows her niece around Haiti, driving through the city before heading to her home and studio in the country. In the studio are paintings of some of the heroes from Haiti’s past like Jean-Jacques Dessalines, Catherine Flon, and Francois-Dominique Louverture, as well as portraits of the girl’s ancestors. When it’s her turn to sit for a portrait, she finds it’s hard to sit still for so long; Auntie Luce distracts her with stories about Haiti and its history. At the end of her visit, her aunt gives the girl her portrait telling her, “These colors, this people, this place belong to you. And you belong to them, always.” Includes an author’s note giving a brief history of Haitian independence and a glossary. 36 pages; grades 1-5. 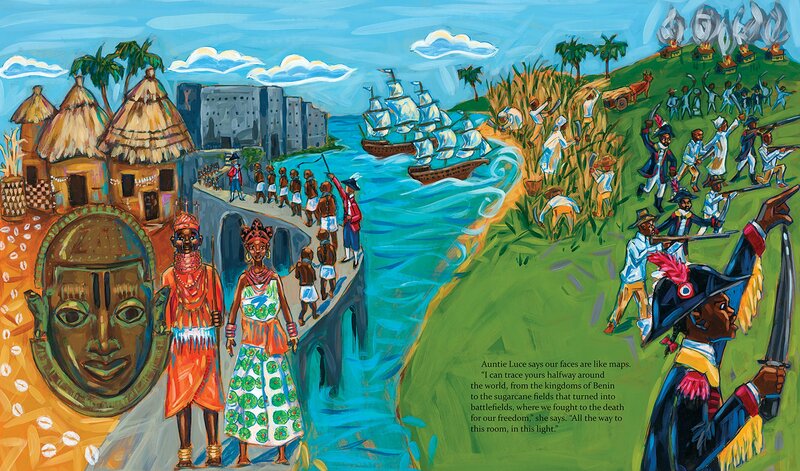 Pros: An ode to Haiti, celebrating its history of independence and its beauty, particularly with the vibrantly colored illustrations. Cons: I wish there was more information about the history of Haiti in the author’s note. Sounds like a great book. I’m adding it to my read list. Thanks! Lots of history & more packed into a few pages. Oh, the power of art.